Members of Samford University's McWhorter School of Pharmacy Class of 2019 were recognized during the school’s annual White Coat ceremony Sept. 25. 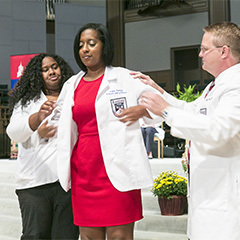 The ceremony included a presentation of a white coat to each student and students reciting the American Pharmaceutical Association's Pledge of Professionalism. Students were presented their white coats by the dean and a pharmacist, faculty member or pharmacy student of their choice. Coaters included numerous McWhorter School of Pharmacy alumni as well as parents, siblings, employers and other professional and student mentors. The induction ceremony was led by Crouch and pharmacy professors John Arnold, Jennifer Beall, Amy Broeseker and Robert Wang. Johnny Brooklere, president of the Alabama Pharmacy Association and Brad Wright, president of the Alabama Society of Health-system Pharmacists also participated in the inductions and offered remarks. Susan Alverson, executive secretary for the Alabama Board of Pharmacy and former McWhorter School of Pharmacy faculty member, offered words of encouragement to the future pharmacists as well. In August the 144-member class, which includes students from 14 states and five foreign nations, began a four-year professional curriculum that leads to a Doctor of Pharmacy degree. The students completed two or more years of undergraduate coursework prior to entering pharmacy school. Frances Cohenour, McWhorter School of Pharmacy class of 2010 alumnus and the 2015 Carl Wayne Shaddix Pharmacy Practitioner of Excellence Award recipient, served as the featured speaker for the event. She urged students to make the most of their four years in pharmacy school by taking an active role in the school and the profession and by following their gut. “Don’t be afraid to take chances. Keep an open mind and realize that you might not end up where you think you will, and that’s okay,” she said. For more than a decade, Rite Aid has sponsored the white coats for the ceremony. Regional recruiter Earl Pace attended the ceremony on behalf of Rite Aid.